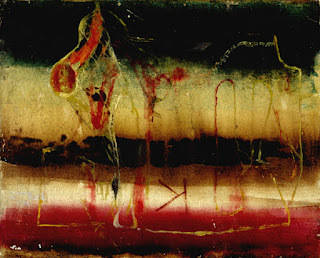 Dusan Marek, Title unknown, 1962, Oil on aluminium, Private collection. I had probably seen surrealist, or 'in the style of' surrealist painting at the Art Gallery of South Australia without realising it's context. In those days there were a number of Australian artists in public collections that had been affected by the movement. Artists such as Jeffrey Smart, Ivor Francis, Eric Thake, Jacqueline Hick and Stan Ostoja-Kotkowski had all been influenced by the 'revolution' in Europe, but few of them had made a long term commitment to the surrealist aesthetic. Even though I didn't know what the art was about, I often felt as if I knew the artists, felt like they were my friends. About this time I had a job as a Numbers Porter with South Australian Railways. My job was to meet trains as they pulled into Adelaide Train Station and record the numbers on the carriages into a ledger. Why, I never knew. It wasn't like train carriages go missing very often, and I soon learnt that except for the two interstate trains the same carriages made the same journeys day after day, month after month, year after year. I would arrive at work, write all the numbers from the previous day in the ledger, which would take around ten minutes, and then settle down to sketch or read a book. It was here that I noticed another numbers porter reading a book on film making. His name was Denys Finney, an aspiring film maker and art enthusiast. We quickly became friends and he showed me the path to how I could become an artist, something I had never thought feasible. We had passionate discussions about art and film, and about what constituted great art. He also introduced me to the world of the European film directors including Luis Bunuel, perhaps the most 'complete' surrealist of all. I started to study the surrealists in more depth and found myself drawn to their vision. At that time my mother was working in one of the few commercial galleries in Adelaide, and had struck up a friendship with surrealist artist Dusan Marek, who's studio lay in the Adelaide Hills. She took me to visit him on two occasions and it was these meetings that have charted a course that I have followed ever since. Dusan was a Czech immigrant who had fled to Australia in 1948. He had decided to become a surrealist at 13 years old, and remained committed to the path throughout his life. He had also worked at the Railways and was very amused by my description of my job. He used it to teach me some valuable lessons about surrealism. "Surrealism is not just an art movement. It is a way of life, a way of thinking, and a way of viewing the world. It is about discovering the marvellous in our existence. But most importantly it is about absolute freedom of thought and expression." he said. The last time we met was shortly before he was to take up a teaching post in Tasmania. He said "Bob, we surrealists must stick together". He left the next day.